Are you looking for Aboilus, Acolus, Adolus, Aeolus, Ambolus, Anolus, Arolus, Asbolus, Axolus, Biolus, Bolus, Cholus, Cobalus, Colus, Dibolus, Dolus, Embolus, Eobelus, Eoborus, Esolus, Gnolus, Gobulus, Homolus, Idolus, Kolus, Lobotus, Molus, Nobilus, Obelus, obole, Ozolus, Pholus, Polus, Psolus, Ptolus, Riolus, Robopus, Robulus, Solus, Stolus, Tholus, Tmolus, or Æolus? 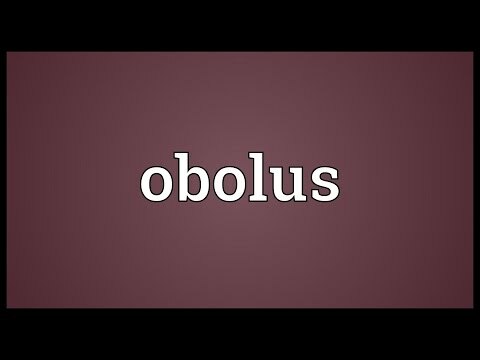 What does obolus mean as a name of something? A silver coin minted in Ancient Greece, valued at a sixth of a drachma. Obolus a.k.a. The obol was an ancient silver coin. In Classical Athens, there were six obols to the drachma; it could be exchanged for eight chalkoi. Two obols made a diobol, weighing around 1.41-1.43 grams of silver. Triobols were also in use. The Attic obolus is the sixth part of an Attic drachma. - The Attic drachma contains six oboli. It answers to the Roman penny, and is worth six French sols. The Attic mina is equivalent to an hundred drachmas, and consequently fifty French livres. Go to the thesaurus of Obolus to find many related words and phrases!